Ontario is proposing to weaken legal protection for migratory birds by exempting commercial building owners from a key provision of the Environmental Protection Act (EPA). The proposed regulatory amendment would remove the requirement for owners to deal with light reflected from tall commercial buildings, which is known to lead to the death or injury of millions of birds in Ontario every year. Please join us in opposing this proposal (EBR Registry Number 012-3605)! In 2013, an Ontario court ruled reflected light from building windows to be a ‘contaminant’ under the EPA. 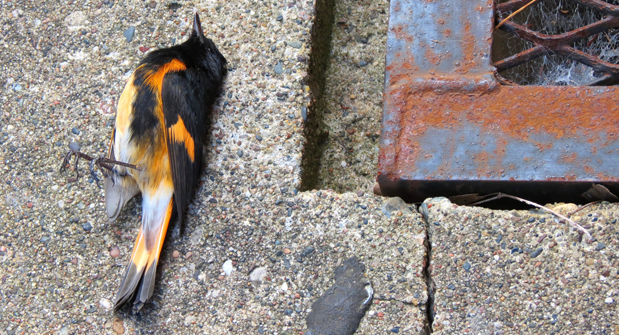 The court confirmed that the Province had the legal authority to require building owners to deal with light reflected from windows that were at high risk of killing or injuring birds. Yet, instead of acting upon the findings of the court, the Ministry of Environment and Climate Change (MOECC) is proposing to give up its power to protect migratory birds from reflected light. Voluntary approaches will not address the problem. Based on over two decades of work by the Fatal Light Awareness Program (FLAP) Canada, it is clear that most commercial building owners will not take voluntary action. Millions of birds, including many species at risk, will continue to die if the problem of reflected light is not adequately addressed. Sadly, these deaths are preventable. Technical solutions are available, but they will continue to be ignored without the compliance and enforcement measures in place to drive uptake by commercial building owners. Join Ontario Nature in urging the MOECC not to proceed with this ill-founded proposal. Let the ministry know that Ontarians expect it to strengthen environmental laws, not to weaken them by changing the rules to sidestep its duties. Please send in comments by the December 04, 2015 deadline. Be sure to reference Environmental Registry #012-3605. IMPORTANT: Please use the form below to submit your comments to the Environmental Registry. If you add your personal touch, the government will give your submission greater consideration. We love to hear from our donors and members. Please don't hesitate to contact Portia Mohlmann at 416-444-8419 ext. 233 or portiam@ontarionature.org if you have any questions. Thank you!